Postcard US-3038799 from Alabama shows the Vulcan statue, the largest cast iron statue in the world, and the city symbol of Birmingham, Alabama that reflects the city's heritage in the iron and steel industry. The 56-foot or 17-meter tall statue depicts the Roman God Vulcan, god of the fire including the fire of volcanoes, also god of metalworking and the forge. It was created as Birmingham's entry for the Louisiana Purchase Exposition (1904 World's Fair) in St. Louis, Missouri. Vulcan is often depicted with a blacksmith's hammer, as in this case while his left hand held a hammer at his side. 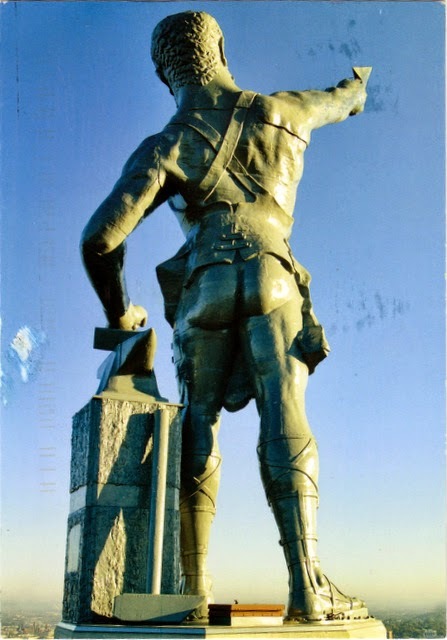 According to Wikipedia, "the statue's naked buttocks have been source of humor for many years. A novelty song, Moon Over Homewood, refers to the fact that the statue moons the neighboring suburb of Homewood, Alabama." It was added to the U.S. National Register of Historic Places on July 6, 1976.